Background: To date, no drugs have been approved for gambling disorder. Numerous publications have described the value of opioid antagonists. 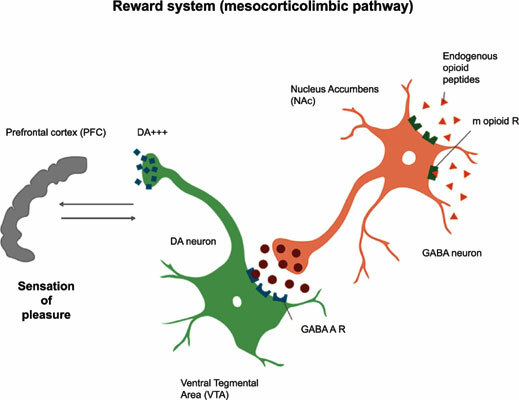 Indeed, the mesocorticolimbic dopaminergic pathway has been suggested as the underlying cause of reward-seeking behaviour, and it is modulated by the opioid system. Objective: This study aims to evaluate the relevance of opioid antagonists for treating GD. Method: A systematic literature review was conducted. A search of the PubMed electronic database, PsycINFO and the Cochrane Systematic Review Database without any limits was performed. Results: There is little information concerning the effects of opioid antagonists on GD. The total search with “nalmefene and gambling” without any limits revealed only 11 articles. The search with “naltrexone and gambling” without any limits generated 47 articles. Nevertheless, the best available data support the use of opioid antagonists, particularly in individuals with a history of alcohol use disorder or strong gambling urges. Conclusion: Future trials are still needed. Indeed, opioid antagonists effectiveness has been investigated in only a limited number of patients, clinical trials do not reflect the heterogeneity of GD and there is little knowledge of the predictive factors of response to treatments. Moreover, differential affinity to nalmefene for kappa receptors may be associated with a particular effect in a yet to be defined addiction phenotype. Head to head comparisons between naltrexone and nalmefene would be helpful in combining other medication or psychotherapy. The identification of subgroups of patients that are more likely to benefit from opioid antagonists should be a goal. Nalmefene, naltrexone, gambling disorder, opioid antagonists, pathological gambling, addictive disorders.